August 25, 2015 By Allyson 1 Comment This post may contain affiliate links. Read my disclosure policy. A few weeks ago, I was grocery shopping and stumbled upon tons of strawberries for CHEAP. My grocery store often marks produce down to .99 for bags or pints or whatever it is, when they are close to expiring. I love to stock up on stuff and freeze it or use it if I can. So, when I saw a whole grocery cart full of pints of strawberries for .99 cents each, I snatched a bunch up. Right away I froze a bunch, but then I was browsing around Pinterest for inspiration on what to use the others for. Then, it hit me. I had been seeing these Galette’s pop up everywhere recently, and I’d been wanting to try them. 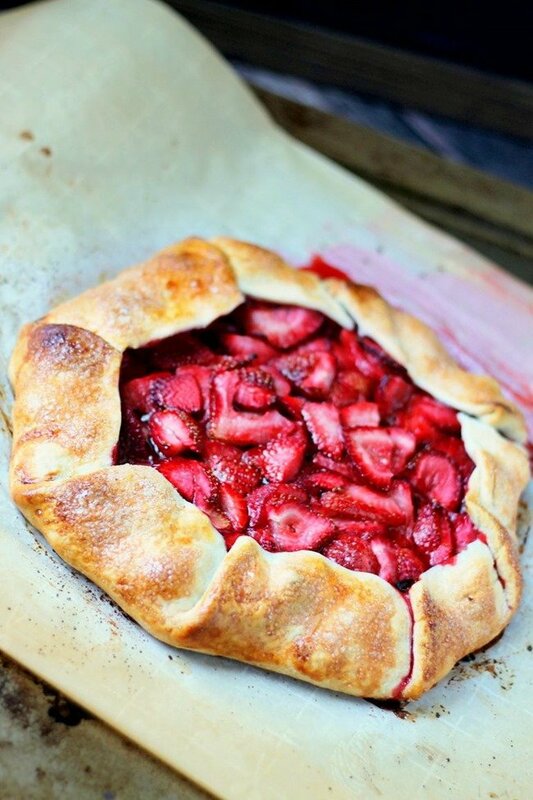 It was settled – I would make a Strawberry Galette. It wasn’t until recently that I actually heard the word, ‘Galette’, which basically means a pie without a top…or a fake pie as I’d like to call it. See, I make no secret of the fact that I am not a baker. I love baking and trying to bake things, but, I don’t have a great record with desserts. Well, at least ones that are really finicky. I can make a mean cheesecake brownie bar, or chocolate chip cookie, but something like a beautiful cake? No way. So, naturally when I discovered this fake pie, I was intrigued. 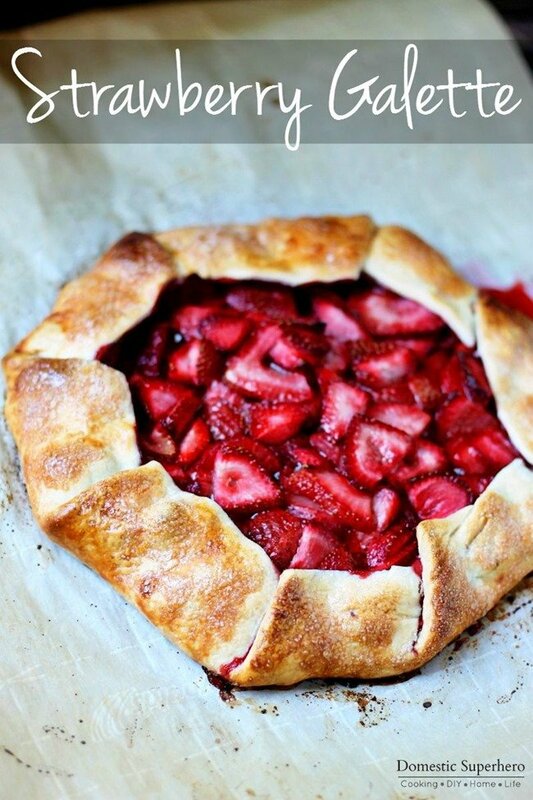 I wouldn’t have to spend hours over a homemade crust (hello store bought! ), and I could pretty much eye ball everything and hope it came out great. Well folks, I nailed it! There are barely any ingredients and work to this recipe, which in my book makes it a perfect ten. You can also use pretty much any fruit or fruit combo – the more the merrier. I would serve this up as a dessert or even at a brunch. It’s so delicious and versatile, and I love how rustic and trendy it is too. I also LOVE how beautiful the fruit looks displayed at the top. In a ‘real’ pie, the filling is hidden, which makes for a nice surprise, but this is definitely more beautiful. 1. In a medium bowl, add strawberries and sprinkle with sugar, orange juice, and cornstarch; gently stir to coat. Set aside for about 15 minutes. 2. On a floured surface, roll your dough out a bit, set onto a parchment lined baking sheet; set aside. 3. Spoon strawberries and juice into the center of the dough, leaving about 1.5-2 inches at the edges (so you have dough to fold up and over). 4. 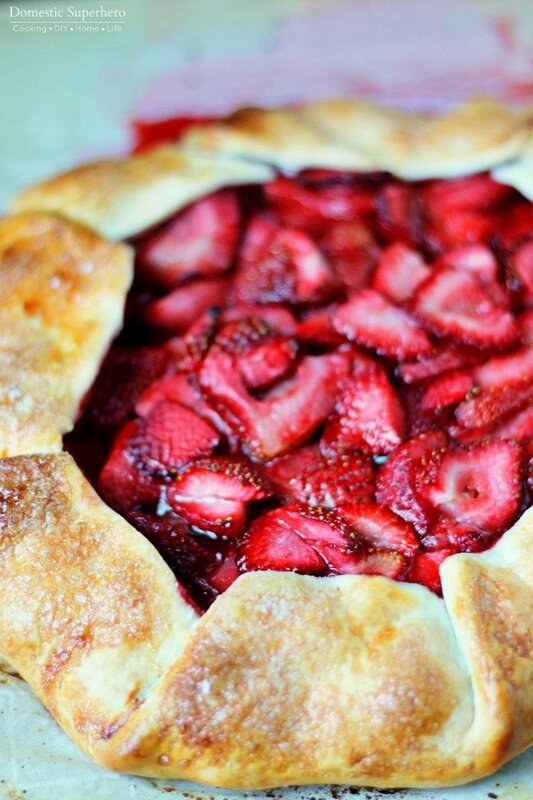 Fold dough up and over the sides of the strawberries, working your way all the way around. 5. In a small bowl, add egg and water; whisk quickly for 15-30 seconds or until frothy. Using a pastry brush, brush egg wash over all visible dough. Sprinkle dough/egg wash with a light layer of sugar. Add butter pieces to the top of the strawberries, scattering around. 6. 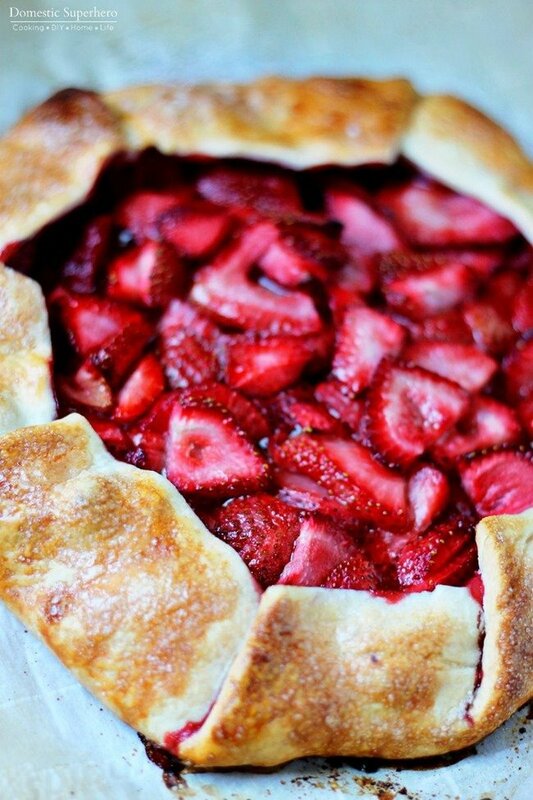 Place into middle of oven, and bake for 20-25 minutes or until crust is beginning to brown and strawberries are bubbly. 7. Allow to cool for 20 minutes, slice, and serve! How can this be stored? Room temp? Or needs refrigeration?